These chocolate treats take me back to my own childhood. My mum hated cooking as she didn’t have the patience for it (she could burn salad) so baking was done very rarely and only after considerable pestering by me and my brother. 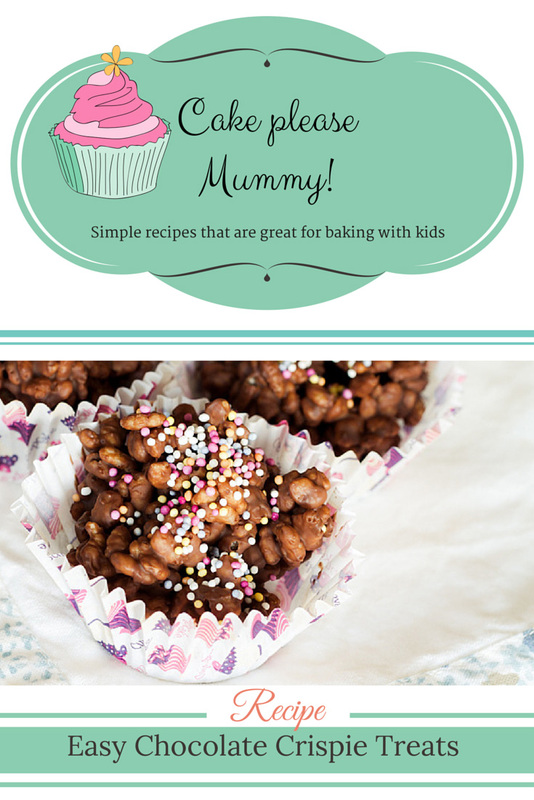 No-bake treats like fridge cake and crispie cakes were the ones she made most often. You only need two ingredients to make these chocolate crispie treats. There’s no baking involved, although you do need to melt chocolate on the hob or microwave, so they’re great for getting your little ones to help you make them. Plus there’s a chocolatey spoon to lick afterwards! A tasty treat that only uses two ingredients. No baking required! Arrange the cake cases onto the baking trays. Break the chocolate into a medium sized microwavable bowl. Microwave on high for 10 seconds. Remove the bowl and stir the chocolate. Microwave for another 10 seconds and stir again. Repeat until the chocolate has completely melted. Add the puffed rice to the chocolate and stir gently with a metal spoon until all of the puffs are covered in chocolate. Spoon a tablespoon of the mixture into each cake case. Decorate the treats with sprinkles if you want to. Put the baking trays in the fridge and allow the treats to set for at least 2 hours. The crispie treats will keep for a couple of weeks in the fridge. I wouldn't advise using cooking chocolate as it doesn't taste very nice. We used two bars of value brand chocolate from the supermarket. If you don't have access to a microwave you can melt the chocolate on the hob. Simply break the chocolate into a glass/ceramic bowl and place the bowl on top of a pan of boiling water. Make sure that the water doesn't touch the bottom of the bowl. Stir until the chocolate has melted. A nice variation of this recipe is to add a couple of handfuls of mini marshmallows to the mix before spooning into the cake cases. Is there a cake or treat that takes you back to your own childhood? I love the chocolate face – that’s definitely the best bit about baking when you’re little! My childhood cake is a lemon sponge; my Grannie used to make it in the summer and it always takes me back! It’s usually a bit of a scrum when it comes to licking the spoon/bowl but Bubs always wins. I love anything lemony especially lemon drizzle cake. We have one rather large lemon on our lemon tree that I think is destined to become one. Thanks! Crispie treats are a big fave in our house – the grownups devour them as fast as I can make them! I loved making Crispie Cakes when I was young. The sprinkles are a great addition!